1.Dry Lips- When seasons change, especially fall into winter our lips tend to get a little dry. 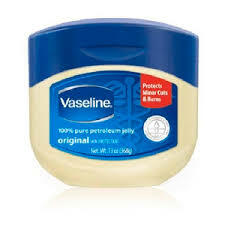 Try moisturizing your lips morning and night with Vaseline. You will def see a difference in the way your lips look and feel. *Bonus Tip* put a little on before applying lipstick and lip gloss, it keeps your lips moist and prevents them from getting dry/sticky from the product. 2.Cracked hands/feet- Hard water can be damaging on our skin in general, but washing your hands while your out and at work can leave them dry and brittle looking. Apply a little Vaseline to your lotion while moisturizing your hands,and at night apply Vaseline directly to your cuticles to keep them from cracking. Same rules apply for your feet. If your feet are really bad, first exfoliate any dead skin, apply Vaseline, then wrap your feet with saran wrap (plastic wrap) and put on some socks for an overnight treatment. 3.Stubborn Makeup- Eye makeup and lip stains can be a real pain to get off sometimes. Because the skin around your eyes and lips are sensitive you don’t want to aggressively wipe them off with a tissue constantly. Sooooo apply some Vaseline first before wiping it off. Now I wouldn’t use this as a complete face makeup removal, simply for your eyes and lips. I never thought to use vaseline to help with mistakes! Thanks so much for the great tips! Great post ! Thanks for following my blog http://www.danetigress.wordpress.com. I like yours and am following back! Thanks for sharing, will do!